The strong earthquakes which have struck Center Italy on the 26th (epicenter near Visso, magnitude 5,9 Richter) and the 30th of October 2016 (near Norcia, magnitude 6.5) have produced major dislocation on a wide extent. An accurate way to measure such displacements is to compare the satellite radar images acquired before and after such events. 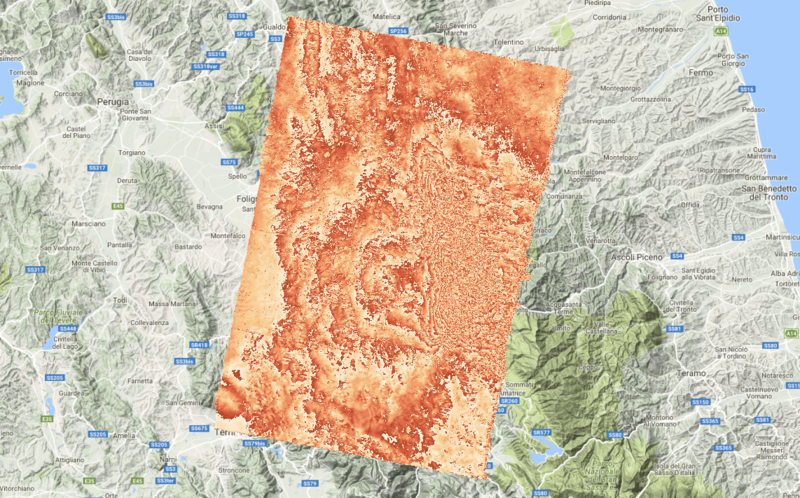 We have analysed with our own software the radar images acquired on the 25th and the 31th of October by the Sentinel-1 satellite, funded by the European Commission under the Copernicus programme. The results, which are aligned with those by ESA, are displayed on the map. The best way to understand the information content of the figure is to imagine each transition from light to dark as the step of a ladder: measuring the downward terrain displacement is akin to descending a ladder. To measure how much a given point has dropped, one counts how many steps have to be descended along a path starting outside the area struck by the earthquake. It not always easy to count the steps, as in some places the signal is too noisy or the descent is so steep that the steps are too close to tell them apart. A close analysis of the map reveals that the first step on the west side is well within the Umbria valley, reaching Foligno and Spoleto; on the east side it touches the Sibillini Mountains range, and on the north-south axis it goes from Muccia to Leonessa. 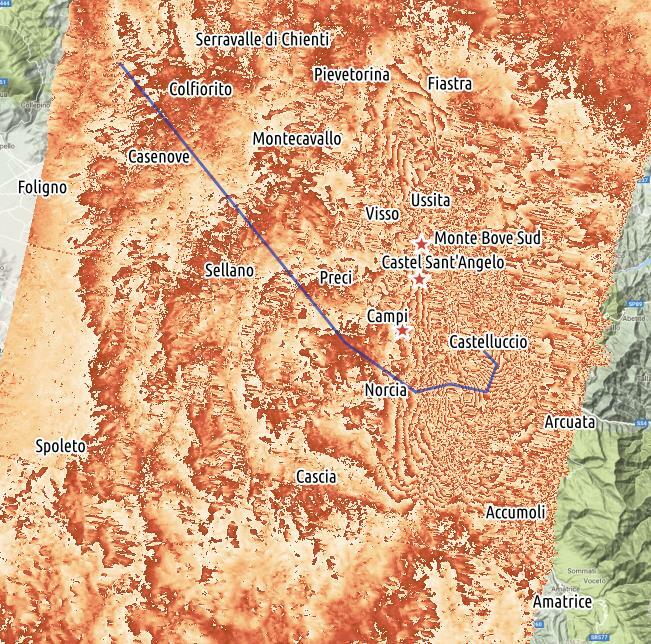 Due to the characteristics of the Sentinel-1 sensor, each step corresponds to the terrain receding 2.75 cm from the satellite, so the displacements are already apparent in Foligno, which seems to have been displaced approximately for 1 cm. Colfiorito is maybe 3 or 4 cm lower than a week before. To simplify the interpretation of the figure, we have drawn a blue path on it. Following the path from the point near Colfiorito, which has moved very little, up to the the point close to Castelluccio, one can count at least 30 steps. Thirty steps, each 2.75 cm high, imply that part of the Pian Grande near Castelluccio has receded approximately 82 cm from the satellite since the 25th of October. On top of this, one should add 20 cm due to the August earthquake. A word of caution: the satellite does not look exactly below it, but with a slight squint . Therefore when one observes a dislocation of 82 cm, it does not directly imply that the terrain has moved vertically for 82 cm. We know that it receding as it is know that the area is subject to an extensive dynamics.